That's the secret of its appeal for me, no doubt. That delicious uncertainty is masterfully handled. Yep. It adds a Lovecraftian undercurrent of unease that’s pervasive and omnipresent, almost like Lynch’s industrial noise in Eraserhead. I think this is probably Abnett’s finest work for 2000AD,* ably assisted by the oh-so-deceptive simplicity of Culbard’s art. *And I say that as an unreserved admirer of Kingdom, and someone who’s never sorry to see a run of Sin/Dex in the prog. TBH, I can’t name an Abnett strip I didn’t enjoy, off the top of my head. Slightly surprised that he’s barely done a handful of Dredds. In general I like Dan Abnett's work. Brink is brilliant and both Lawless and Kingdom is great as well. Sin/Dex and Grey Area is readable but the type of strips that if they don't return I will not miss them. Yeah, while they all have lovely bottoms, I have no problem arguing that Abnett is second only to Wagner as the comic's top writer of the present day. And that is in full acknowledgement of the depth and breadth of the writing talent currently contributing to the prog, old hands and new blood alike. Only more Abnett love from me, too! BlackLight, Sacho Panzer, Atavar, Black Atlantic are all OK thrills. The VCs, Kingdom, Insurrection, Lawless, Brink are all AMAZING thrills! I still can't make up my mind whether I like his Durham Red or not, but I think that has more to do with Harrison's artwork, which I also switch around on, sometimes on the same page. I don't remember anything about Black Atlantic - shall have to have a look at the Heroes... blog to see if it rings any bells. 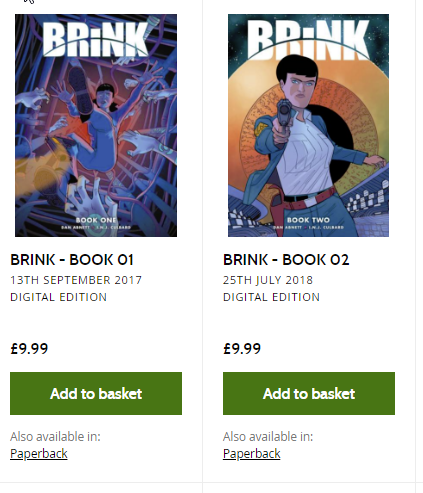 I dropped the groats for Book 2 (unfortunately from Amazon, as the 2000AD store only had the digital or Book1 & 2 package) and just *ate* that thing up. Fully prepped and ready for Book 3. I can't remember the last time I looked forward to a comic series this much (dare I say Halo book 3?). You're not the only person who's had that UI issue with the site. I thought the same with something, and only ended up buying because I accidentally clicked on what I assumed was a 'out of stock' greyed out button. No probs, thanks for the feedback feedback. I must admit that I have *never* noticed the "Also available in paperback" footer! I can also see how having separate digital/paperback results would create a lot of noise on search results. At least I'm sorted from this point. I just finished book one. Really good hard sci fi. I really like it's insanity bits. I'm pretty sure wouild happen if humans had to survive as a species by living on a space station. Also cool that while the main characters are talking about the causes and what not, it still seems like they're affected by it. Especially since there are things which seems off, but still characters acts as if it's normal. Makes the said insanity feel "real". But it's not only the writing. I really like the art as well. Looks very unique. Fantastic use of colours. Great pacing. I really like the reoccurring visuals of things floating in the air. Everything from the space station they're on to stuffing from down jackets after someone's shot. Gives the sparsely decorated space station a lived feeling. Read it digital, but I'm fairly certain I'll have to pick up book one and two soon. Especially since three is out next year.